Hello I’m Jenny and I love to plan! I am a wedding planner & stylist, working with couples to bring their wedding vision to life and ease any wedding planning stress. I am detail obsessed, I’ve been told my wedding day running orders look like military operations, I take that as a compliment! 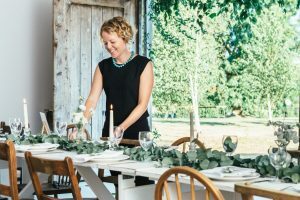 My job is largely in the preparation, working on anything from guest transport logistics and RSVP management to designing your tablescapes and sourcing your perfect suppliers. Guiding you through each stage of planning your day, exciting and inspiring you with ideas along the way. On the wedding day itself, I work discreetly in the background taking care of the behind the scenes jobs, ensuring the day is smooth running, relaxed and memorable for all the right reasons. Allowing you and your family to enjoy the lead up and every moment on the day itself. I am very passionate about what I do, I love getting to know my couples and thrive on the challenges my work brings me. For me Boconnoc is such a wonderful venue to plan a wedding at. The reason being it typically attracts couples that want something different, they don’t want a tick box wedding that you may find in a hotel for example. I spend a lot of time getting to know my clients personalities and take joy in helping to create a wedding that both defines and delights them as a couple. Boconnoc is a venue that allows me to do this, with the flexibility to plan a day unique to them. As well as this I like that it is completely exclusive use, meaning it is just yours for the day. It feels like you are in a Boconnoc bubble when you are there and I love that! The best thing for me is that moment after I have worked with a couple for months, sometimes even years, seeing all the hard work and planning come together on the day and how happy and relaxed they are. Dramatic coastlines, stunning beaches and beautiful countryside is the main draw for many I think. Most of my clients live and work in cities and want to escape the hustle and bustle to enjoy their wedding with friends and family in the quiet countryside. Cornwall is an obvious choice for that. As well as this the wedding industry in Cornwall is a bright and beautiful tapestry of creative beings and specialists all playing their part to create these wonderful days. There is an abundance of fantastic suppliers here, from caterers and cake makers to florists and musicians. I have loved and lived in Cornwall all my life, which has allowed me to build a network of contacts and local knowledge, there really is such talent in the county. For me it has to be one of the weddings I have planned at Boconnoc actually! The couple, Ariko & Jamie, were very creative people and had some cool and different ideas. Ariko is from Japan, she wore a traditional 100% silk kimono that no one knew anything about apart from her and I. She looked incredible, her groom had tears in his eyes when he saw her. Jamie and his groomsmen arrived to the ceremony on classic motorbikes. The sound of the roaring engines as they came down the long sweeping driveway was so dramatic. They had a humanist ceremony under the big tree on the lawns at Boconnoc. We hung white balloons in the branches, which swayed gently in the breeze. I remember during the ceremony a gust of breeze blew lots of the blossoms off the tree creating a sort of natural confetti at the perfect moment, it was beautiful! The bride had been attending ceramics classes during the lead up to the day and handmade 10 different and unique vases for the table flowers to go in. The day before we were outside in the beautiful sunshine with Ariko and her girls arranging them, a lovely personal touch. Their Krispy Kreme wedding cake was far from traditional and the only cake I have ever seen completely eaten! I could talk about this wedding all day, but these are some of the most memorable things that stuck out for me. I once had to peel off the labels on 150 water bottles and replace them with a monogram sticker of the couples initials. That’s a very individualised wedding when even the water bottles are personalised! I am not really one to follow trends, I prefer to create weddings which are tailored around my couples personalities and what they feel passionate about rather than what is popular at that time. That said I appreciate the inspiration trends can bring. I love the pantone ‘living coral’ announced as 2019’s colour and am excited to work on ways to incorporate this pallet into some of my clients weddings this year. Grazing tables rather than served canapés, commonly including meats, cheeses and fruits. Presented beautifully and ensure your guests never go hungry are a great idea. The use of grasses instead of foliage has been popular. I had a recent bride who incorporated pampas grass into her ceremony and reception décor. It gave a bohemian aesthetic and works well if you are opting for a neutral colour scheme. I often see a lot of wastage at weddings, so am pleased that eco conscious and ethical weddings are on the rise. From ethically made wedding dresses to local produce served at the wedding breakfast, this is a trend I am very happy to follow. Jenny will be styling the LPM Bohemia marquee which will be just off the Garden Room in the main house at our Open House Wedding Event on Saturday 2nd March 2019, 10am – 3pm. We hope to see you there! Photo gallery credits: Taylor and Porter, Matthew Sumi. “She is the fairy godmother of weddings! With a sprinkle of magic Jenny made our wedding dreams come true. She took our fragments of dreams and turned them into a golden, glowing reality: enchanting bride draped in French lace; 13th century church; tumbling peonies, picturesque lambs, sparklers lighting the night sky as the couple drove off in a vintage Rolls. Perfection. Both winsome and amazingly efficient, Jenny tackles any need or desire you have for a wedding. She sources hard-to-find items; she tackles difficult projects; she works tirelessly and with great good cheer, and in the end, we all live happily ever after!